Elbert Culpepper and Carrie H. Giles married 3 May 1899 in Lauderdale Co., MS.
Mamie Culpepper, Wife, F, Wh, 19, md@19, MS/MS/AL. Miss A. B. Culpepper and W. R. Brunson married 23 Oct 1894 in Lauderdale Co., MS.
+ Ida A. Culpepper, Feb. 12, 1873 - Aug. 23, 1891 (Wife of W. P. Culpepper). W. P. Culpepper and Ida McCann married 22 Nov 1888 in Lauderdale Co., MS.
Adrian Malachi Culpepper, RFD #4, Meridian, Lauderdale Co., MS, Age 38, Born 3 May 1880, White, Traveling Salesman for New Orleans Coffee Co. at Meridian, Lauderdale Co., MS. Nearest relative: Burniece Culpepper, Wife, RFD#4, Meridian, Lauderdale Co., MS, /s/ Adrian Malachi Culpepper, Medium height, Medium build, Gray eyes, Black hair, Stiff hip. Registered 12 Sep 1918 in Meridian, Lauderdale Co., MS.
Stanley Culpepper, Son, M, Wh, 8, sng, MS/MS/MS. 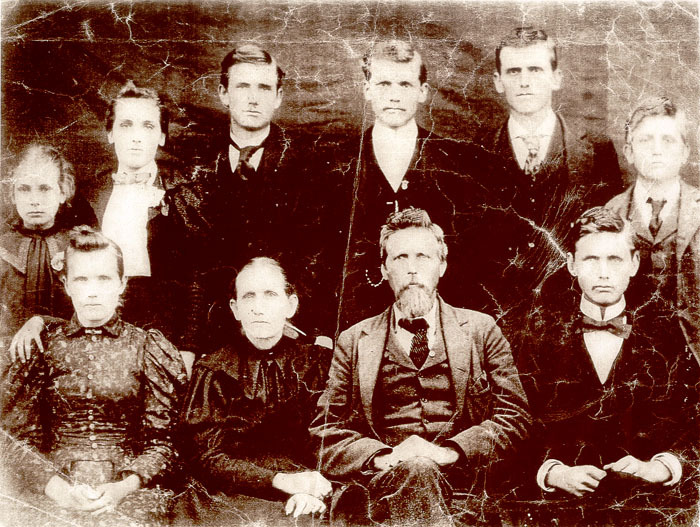 W. P. Culpepper married Annie Brunson on 18 Oct 1895 in Sumter Co., Alabama. Miss M. V Culpepper and G. L. Tate married 15 Feb 1898 in Lauderdale Co., MS.
Pea River Sketches, Enterprise, AL: Pea River Historical & Genealogical Society, 1988. "Robert Archie Culpepper", pages 92-93. T. M. Culpepper and Alice C. Morgan married 10 Jun 1900 in Lauderdale Co., MS.
+ Hubert Jones Culpepper, June 28, 1911 - May 10, 1931. Sallie Morgan, Mother-in-law, F, Wh, 78, wid, MS/AL/AL. Hubert J. Culpepper died May 1931 in Jefferson Co., Alabama. + Sallie Cross Morgan, Feb 14, 1852 - Dec 7, 1938. A. L. Culpepper and Mattie J. Brookshire married 26 Dec 1900 in Lauderdale Co., MS.
J. T. Culpepper and Miss M. A. Boswell married 5 Dec 1889 in Lauderdale Co., MS.
Clarence H. Culpepper, Age 25, Meridian, Lauderdale Co., MS, Born 9 Feb 1892 in Rosser, (Sumter Co.), AL, St Car Motorman for Meridian Light & RR Co., Meirdian, Lauderdale Co., MS. Dependents: Wife and 3 children. Married. White. Prior Military Service: None. Grounds for Exemption from Draft: Deformed hip. /s/ Clarence Culpepper, Short height, Stout build, Black eyes, Brown hair, Not bald, and No disabilities. Registered 5 Jun 1917 in Meridian, Lauderdale Co., MS.
Lawrence E. Culpepper, 10 Aug 1896 - 1 Mar 1949, Served as Private 61st CO 16 REC Battalion 162 DB, US Army, Interred 4 Mar 1949 in Arlington National Cemetery, Section 12, Site 4747. Lawrence Edward Culpepper, Age 21, Whynot, Lauderdale Co., MS, Born 10 Aug 1896 in Whynot, Lauderdale Co., MS. Father Born in Whynot, Lauderdale Co., MS, Employed by J. J. Culpepper at Kewanee, Lauderdale Co., MS. Nearest Relative: Joel Culpepper, Whynot, Lauderdale Co., MS, White, /s/ Lawrence Edward Culpepper, Tall height, Medium build, Light Blue eyes, Dark Brown hair, No disabilities. Registered 5 Jun 1918 in Lauderdale Co., MS.
Mary B. Culpepper, Daughter, Wh, F, June 1899, 11/12, S, MS/MS/MS. Mary B. Culpepper, Daughter, F, Wh, 10, S, MS/MS/MS. Since Elda did not appear in the 1910 census (enumerated 15 Apr 1910), it is assumed that the birth year found on his tombstone is off, probably by one year. + James Thomas Culpepper, Aug. 22, 1920 - July 19, 1989 (Pvt. U. S. Army). + Elda Culpepper, Alabama, Oct. 21, 1909 - Sept. 3, 1966 (Pfc. Co. C 626 TD BN, World War II). Elda Culpepper, born 1910, White, Native of Mississippi; Resided in Sumter Co., Alabama; Enlisted on 13 Feb 1942 in Georgia at Fort McPherson Atlanta in the US Army as a Private for the duration of the War plus six months; Education: Grammar school; Marital Status: Single, without dependents; Height: 66; Weight: 124. E-mail written 11 Apr 2013 to Warren Culpepper from Silas E. 'Gene' and Johnnie Haughton (d/o #2536), e-mail address. James T Culpepper, born 1922 in MS, White, Single, Education: Grammar School, Height/Wt: 64/134; Resided in: Lauderdale Co., MS; Enlisted 25 Sep 1942 at Camp Shelby, MS (Drafted). Obituary of Ola Mae Clifton (#2542), published 24 Jun 2004. Obituary* 24 Jun 2004� SUMRALL - Services were held today at Jones & Son Funeral Home for Ola Mae Clifton, 70, of Sumrall, who died June 21, 2004, at her home. Burial was in Anderson Cemetery. Mrs. Clifton was a housewife and member of the Anderson Quartet. She was a member of Mineral Springs Baptist Church in the Dixie community. Miss M. L. Culpepper and E. D. Taimes married 29 Oct 1896 in Lauderdale Co., MS.
Ida Culpepper and W. H. Garrison married 2 Jan 1895 in Lauderdale Co., MS.
J. H. Culpepper and Maggie Waller married 19 Nov 1897 in Lauderdale Co., MS.
+ Mary "Lib" Culpepper, Mar. 29, 1916 - Jan. 13, 1999. Mathew C. Culpeper, Son, M, Wh, 8, sng, MS/MS/MS. Edith Culpepper, Daughter, F, Wh, 9, sng, MS/AL/MS. + Mabel H. Culpepper, Nov. 6, 1886 - July 7, 1966.